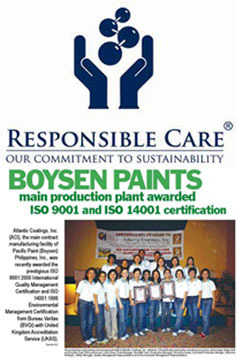 Pacific Paint BOYSEN® Philippines, Inc. and its main contract manufacturer Atlantic Coatings Inc. became the first Filipino paint company to be awarded the use of the Responsible Care logo during the last annual convention of the Samahan sa Pilipinas ng mga Industriyang Kimika SPIK , also known as the Chemical Industries association of the Philippines. Anything from a good kitchen tastes just like that and gives you more. Count on TBWA-Santiago, Mangada and Puno’s creative chefs, in partnership with Brew Productions this time, to brew up a storm of an entry to the 2006 New York Festivals film and television advertising competition. 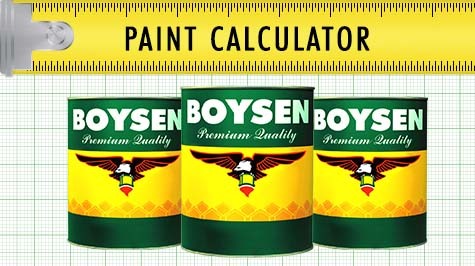 BOYSEN®, the nation's leader in paint, was instrumental in fulfilling a lifelong dream of the Philippine Educational theater Association PETA . BOYSEN® helped build the PETA Theater Center in Quezon City, which will serve as the permanent venue for PETA's world-class performances. Trying something new, BOYSEN® made use of a two-floor booth in this year’s Philippine World Building and Construction Exposition or WORLDBEX 2006 held at the World Trade Center Manila. With more floor space, guests are able to explore the booth easily while conversing with our Marketing Executives.